We went to the Outdoor Retailer trade show to video all the new climbing gear that’s coming in 2018. While those videos get some editing action, we’ve put together a post of photos and descriptions of all the new 2018 climbing gear: hardware edition. 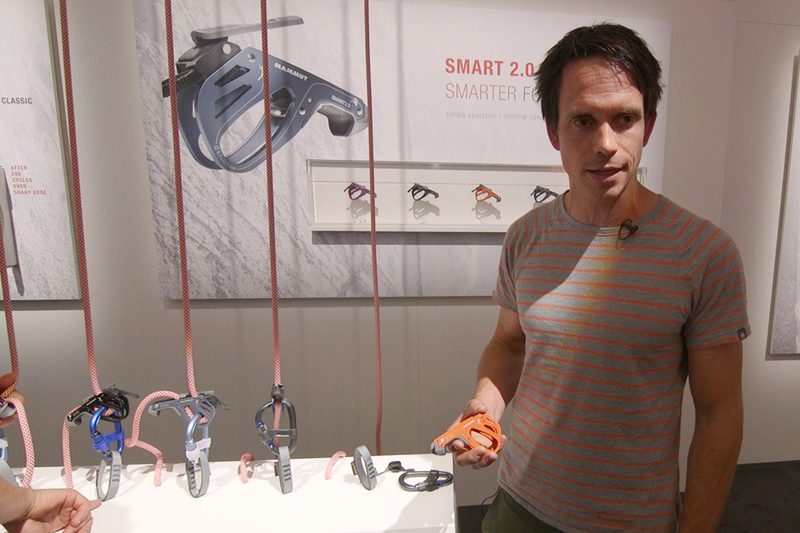 The Birdy is an auto-locking belay device (à la GriGri) that is quite compact. It has all metal parts which makes it slightly heavier than most other auto-locking devices but, in trade, you gain durability. The Birdy is mostly aluminum but all rope-bearing surfaces are made of steel. The defining feature is that the rope feeds directly out the front of the device avoiding any kinking. It will accommodate single ropes from 8.5mm – 10.5mm. The Mercury kid’s helmet is exactly the same as the adult version other than the size. This will be great for adventure parks as it was made to be durable. It also has a magnetic buckle on the chinstrap for easy on/off. Black Diamond is expanding their trad range with these hot forged offset nuts. Great for pin scars and irregular cracks, which means they place almost anywhere. The sizing starts just above the Micro Stopper line. Climbers with BD’s regular Stoppers will notice the colors of these offset nuts will fit right in with the regular set. The larger nut sizes (10 & 11) have holes on the sides to decrease weight. Offered individually or as a set with sizes 7-11. 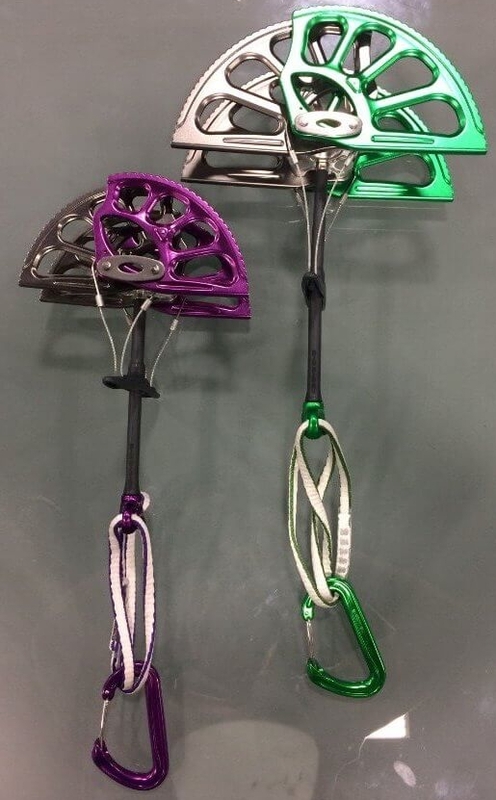 CAMP is updating all their crampons with new anti-balling plates. These new plates are plastic molded and shaped to further reduce snow collection and bring the weight down. The price goes up a bit ($10-20) to cover R&D and the mold making. Also, crampons that were previously sold without anti-balling plates, like the XLC series, will now come standard with anti-balling plates. 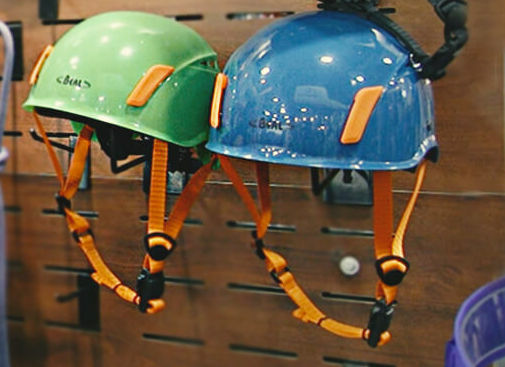 Key features and updates to the Click Up include: less metal and more plastic to reduce the weight, redesigned shape to improve ergonomics, a wider rope range (8.5 mm – 11 mm), and the “V-proof system.” The V-proof system is a safety measure that helps to activate the braking system even when a belayer has their brake hand above the belay device (which would typically make it difficult for the device to lock up). It accomplishes this via a plate on the top of the belay device, that you open when you insert the rope and then it has a spring that closes it shut. The Ceros is a new version of the Rhino carabiner which has a horn that’s designed to keep auto-locking belay devices like the GriGri from cross-loading the carabiner. In addition to the horn on the spine, the Ceros adds a belay keeper. The Ceros will come in 3 versions, a screw gate, 2-stage locker, and 3-stage locker.To get a better sense of the design of the body, you can see more details about the original Rhino in this video. A subtle note: All of DMM’s locking carabiner gates have been recently updated to include more grip on the thimble (compared to most carabiners that are knurled) and this new thimble design is included in the Ceros. Holding an impressive 14 kN these new large Dragon cam’s will be some of the burliest and lightest options on the market. Per DMM’s style, these are hot forged at DMM’s facilities in Wales. At the Outdoor Retailer show, Pamela Shanti Pack came by the booth so often the DMM guys suspected she might wear a hole in the carpet 🙂 And she wasn’t the only person who fell in love with these beauties. The Bulletproof carabiner takes advantage of lightweight aluminum for the body and a durable steel insert where the most abrasion would occur. The Bulletproof screw is the same basic shape as the bent / straight Bulletproof carabiners released in 2017. The screw version is small and would be great for personal lanyards where clipping into bolts may previously have been creating sharp burrs. The Bulletproof screw would also great for first bolts that get the most wear or traverses where you want the extra safety of a locking carabiner. All Bulletproof carabiners use the same hybrid concept of aluminum and steel to be more sustainable. Adding steel ensures the carabiners are more durable and will take much longer to wear out. The HMS shape will be new for 2018 and come in a screw gate version, 2-stage auto-locking (FG) and a 3-stage auto-locking (Triple FG). The first generation Smart was launched in 2009 and it’s getting a few updates for 2018. The main change is an improvement to the braking effectiveness: it brakes a lot faster and completely blocks the rope. Mammut also expects improved ergonomics with a soft, two component grip. The Smart 2.0 also has an optional add-on component called the Smarter (sold separately for $12). The Smarter is a piece of plastic that fits between the climber side of the rope and the break side of the rope. It creates a gap between the rope that helps the Smart 2.0 engage in case of a fall while the belayer has their brake hand above the device. A replica wooden ice axe to celebrate Grivel’s 200 year anniversary in 2018. The head is hot forged and engraved, it includes a leather protector for the pick and adze, and it comes in a special wood presentation box. The shaft is made of laminated ash and actually passes all the modern climbing certification tests for ice axes. The 200 is a true work of art to showcase the history of Grivel and the history of climbing in the Alps. The Captive Plume has a small wire gate on the top carabiner that prevents the carabiner from rotating while clipped. Thanks to this additional wire the Plume is much less likely to become cross-loaded, loaded on the nose, or flip upside down while clipped to a bolt or while dangling on your harness. Since Grivel is using their lightweight Plume carabiner shape it was designed to be an alpine draw. For a beefier draw with this same safety feature check out Grivel’s Captive Alpha and Captive Beta. The Help is a carabiner perfect for the clip stick or a first high up bolt. It has a small spring gate at the top of the carabiner that holds the gate of the carabiner open. This is actually one of the simplest and effective solutions to keep a gate temporarily open that we’ve seen. And it is more environmentally friendly and easier to use than a branchlet. 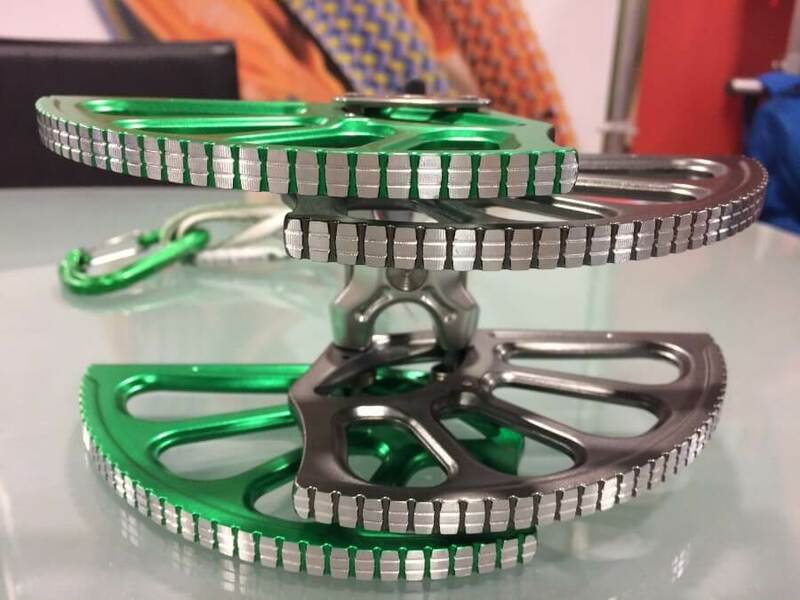 A combination auto-locking carabiner and rigging plate. Normally a rigging plate would use one carabiner at the anchor, an additional carabiner connecting the rigging plate to the first carabiner and the rigging plate itself. The Vlad combo reduces those 3 pieces in a normal setup to 1 piece. The Vlad carabiner is also a bit narrower and longer than other Grivel carabiner shapes which will allow the carabiner to always find the strongest axis no matter what is clipped into it. This is a speciality piece that is suited for rescue, hauling situations, or other more complicated big wall setups. We’re betting riggers and arborists will also find this device handy. The Boreo helmet is a hardshell helmet that will replace the Elios. It’s top cover is an ABS hard plastic shell but it also has total coverage of EPP and EPS foam on the inside of the helmet. Like the Sirocco, it has a combo of EPP foam on all sides and EPS foam on top to protect against falling objects. This helmet will cover more head-hitting scenarios as it offers more front, back, and side protection than the Elios and many other climbing helmets on the market. It will come in 2 sizes, S/M and M/L in white, blue, green, and red. A semi-technical T-rated mountaineering ice axe. 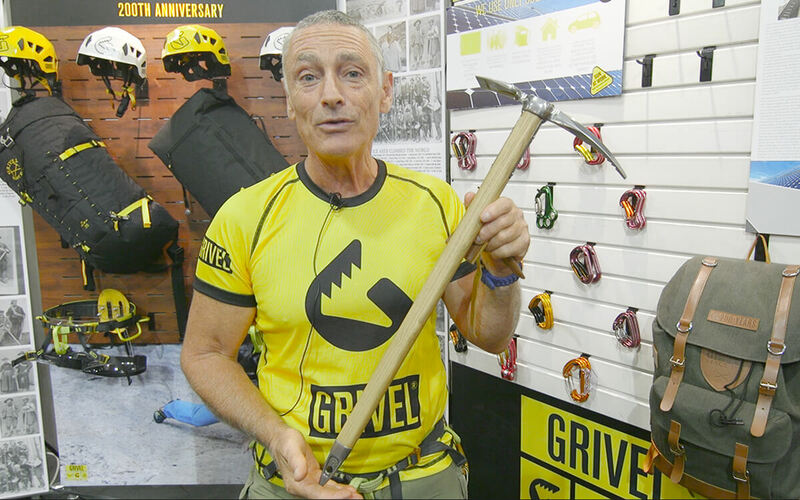 The adze model will come with the glacier pick that will be great for self arresting and light climbing. The hammer version comes with the headwall pick which is a classic reverse curve pick with lots of teeth for grip on bulges and edges.With the included allen wrench you can interchange the picks and switch from hammer to adze, which is actually quite rare for semi-technical tools. Picks and accessories will also be sold separately for interchanging. The shaft also includes a moveable trigger rest. Coming in 50, 60, 65 lengths. Made in the USA! A traditional B-rated mountaineering ice axe coming in 60, 65, 70, 75, and 80 cm lengths. Made in the USA everything from the stamping, anodizing, and injection molding is all done in the Pacific Northwest. It has a bonded construction in the head which is stronger than traditional pins. The chromoly steel head is connected to the shaft with Grilamid plastic (same as ski boots) so it performs well at low temps and is very strong — it can still drive in pickets. The connector should also add more hand warmth than traditional metal would and it’s narrow construction will allow for many different hand positions. An adjustable trigger rest is available as an add-on accessory. A lightweight version of the Kobah (same head, connections and shaft), it comes in one size, 50cm. The spike is a little different than the other steel spiked Kobah models to reduce weight: it has a 45 degree cut that is plugged to avoid snow build-up. The head is steel to ensure durability, longevity and usefulness. A trigger rest is available as an add-on accessory.